The reason this girl gives as a support for her standpoint is remarkable for several reasons, but I’m interested in the fact that it is formulated with a counterfactual If…then-sentence. I have been studying this way of formulating an argument – or, in other words, this presentation mode of an argument – for some time. Over the years I have gathered a wide collection of arguments presented in the counterfactual mode, examples that I have found in newspapers and sometimes heard on radio or television and examples that my students have found for me. A large part of my collection consists of examples in which an appeal is made to human behaviour, as in the above argument displaying the girl’s opinion about whether breast cancer is a treatable disease. In this paper I will discuss some reasons why it is strategic to present an argument with a counterfactual If…then-sentence. It has often struck me that arguments in which an appeal to behaviour is made, are frequently presented in this way. From the perspective of the theory of strategic manoeuvring (van Eemeren 2010; van Eemeren & Houtlosser 2002) this presentation mode of an argument can be considered to be a strategic choice for formulating an argument. This would mean that this presentation mode was chosen for these arguments for good reason, namely to make it easier for them to be accepted in the evaluation procedure. To answer my question I will first give a more precise description of the arguments in which an appeal to behaviour is made and discuss their evaluation criteria. Then I will address the issue of their presentation mode. In my collection of arguments in which an appeal to human behaviour is made, an appeal such as this is made to argue the truth or falsity of a descriptive standpoint. [ii] I have divided the examples in my collection into two categories based on the criterion of whose behaviour is being referred to. In this argument, the arguer questions the veracity of the intentions or emotions that the one whose behaviour is referred to claims to have. The argument put forward by Robert Dekker shows that an arguer can also attribute intentions or emotions to the person whose behaviour is referred to. (5) My disease is not treatable, because I have amputated my breasts. (6) I don’t have commercial aims, because I don’t book big names. (7) There is no problem [I am not guilty of using dope], because Rabo put me on the team. (8) The PVV doesn’t really want to take a leading role in the city council of Almere, because they have not made an effort to negotiate more. (9) If a person has her breasts amputated as a precaution against a certain disease, this indicates that the disease is not treatable. (10) If organizers of events have commercial aims, they will book big names. (11) If the management of a cyclist team gives a team member a place on a tour, this indicates that this cyclist has not been using dope. (12) If political parties do not make an effort to negotiate more, this indicates that they are not really interested in taking part in the city council. In Jansen (2007b; 2007c; 2008; 2009a; 2009b) and Jansen, Dingemanse & Persoon (2009), for each of the three pragma-dialectical types of argument (symptomatic, causal and analogical) it is hypothesized whether the presentation mode with a counterfactual If…then-sentence is a more advantageous way of formulating an argument than a presentation mode without one. Using the theory of strategic manoeuvring as my theoretical framework, I propose that, along with all the other reasons that determine which of these two presentation modes is chosen, rhetorical motives have a role to play. That is: arguers will presumably choose to formulate their arguments in the most convincing way. I start with the assumption that the arguments that I have discussed so far were formulated with a counterfactual If…then-sentence to easily pass through the evaluation procedure. The question then is: what would put this presentation mode before the other one? To answer this question, I first want to examine what arguments that appeal to human behaviour actually try to argue and how we should evaluate them. I will then turn to the issue of their presentation mode from the perspective of the evaluation criteria and address the question as to whether the counterfactual presentation mode hinders the critical testing of such arguments. Braet (2004; 2007, p. 73) and Walton (2002, a.o. pp. 107; 119; 326) have characterized the classical argument from plausibility as a plausible causal or symptomatic generalization about human behaviour. This means that an evaluation of such argumentation would either depend on the issue of whether it is likely or not that certain behaviour is a sign of a certain state of affairs or a certain state of mind. Or it depends on whether or not it is likely that a certain state of affairs or state of mind could have caused certain behaviour. But if we are going to examine these arguments critically, it becomes clear that the evaluation of arguments in which an appeal to behaviour is made, should involve more. For one thing, rather than the generalized principle about human behaviour itself, it is the applicability of this principle to the person whose behaviour is referred to, that plays a role in the evaluation. After all, a critic can always say that the character traits of this person or the circumstances that this person is in, make it unlikely that (s)he has acted in the way that people generally do. The PVV may be a political party which behaves differently from other parties because they are rather inexperienced. And the organizer of the music parties called Technootjes may behave differently because he lacks the skills necessary to persuade big names to come to his party. So, arguments in which the standpoint expresses the intentions or emotions of the person whose behaviour is referred to, should be evaluated by taking this person’s character into account. Rather than querying the likelihood of how people in general would behave in a certain situation, the question must be asked as to whether this particular person would be likely to behave in this way in such a situation. Another factor also plays a role in the evaluation of arguments in which an appeal to behaviour is made. This factor is especially applicable to arguments that have a standpoint in which a state of affairs is expressed and concerns the fact that this state of affairs is always an estimation of the state of affairs by the one whose behaviour is referred to. The argument used by the Rabo cyclist Thomas Dekker claims that because Rabo did not fire Dekker, this indicates that Dekker had not been using dope. The appeal to behaviour consists of the assumption that if a cyclist team management knows about dope usage, they would fire the cyclist in question. But this assumption would never support the standpoint. After all, if Rabo thinks that Dekker has not been using dope, this is certainly no guarantee that he has indeed not been doing so. This conclusion seems to reveal the weak spot of all the arguments that have a standpoint in which a state of affairs is expressed. After all, the state of affairs expressed in a standpoint is always an estimation of the state of affairs by the one whose behaviour is referred to. What this means is that in order to evaluate arguments in which the standpoint expresses a general state of affairs, the relevant question is whether the person whose behaviour is referred to can be considered to be a competent or knowledgeable source. We have to consider whether this person has the capacity to make a sound judgment of the state of affairs expressed in the standpoint. The argument of the girl who had her breasts amputated shows that such an evaluation does not have to result in a negative judgement per se. The state of affairs expressed in the standpoint of the girl’s argument – that there is no medical treatment for hereditary aggressive breast cancer – is actually the estimation of this state of affairs by this individual girl. So why should we believe her? Well, we have pretty strong reasons to believe her. In fact, we would probably believe any person who had had her breasts amputated. It is very unlikely that women would misjudge whether an amputation was necessary, because they would do all they could to get the relevant information. And we also know that doctors will only amputate if there is no other way possible. We can therefore conclude that it is quite likely that the girl is a knowledgeable source. Now the question is: What makes these arguments more bizarre in the presentation mode without the counterfactual If…then-sentence? It seems to me that the latter presentation mode shows very clearly that these are cases of non-argumentation, because they rely completely on an appeal to ethos. The inference license of the first argument is: ‘If I am selling these clothes, they are in a good condition’. This statement raises all kinds of questions. First, we don’t know anything about this person’s character: we don’t now what this person’s general judgement of the condition of clothes is and we don’t know whether we can trust him/her about these specific clothes. Second, the reason that is put forward looks circular because the fact that this person is selling these clothes on the internet specifically raises the question as to whether they are in good condition or not. After all, this is precisely what a potential buyer would wonder about. These problems mean that this argument cannot be evaluated. In contrast, the counterfactual argument brings the appeal to ethos and its circularity less to the fore. Its inference license camouflages the circularity because it suggests new information by calling up a new situation, namely the hypothetical situation in which the clothes are not sold. Therefore the argument distracts attention from three facts: these clothes are indeed actually being sold, this situation is being put forward as a reason for their good condition, and this reason cannot be evaluated because, to do so, we have to rely on the ethos of a person whom we do not know. Although the counterfactual argument is a gratuitous argument as well, it conveys the impression that a reason is actually put forward. The same holds for argument (16), with the inference license ‘If I am doing it, God approves of it’. In this non-counterfactual presentation mode, it is very clear that the argument is based on the assumption that this minister knows exactly which actions are approved of by God and which are not. That the minister is a knowledgeable source about God’s intentions is supposed to be apparent from the circular reasoning in which an appeal is made to behaviour which both father and daughter know is not right. It seems to be the case that, in the presentation mode with a counterfactual If…then-sentence, this dubious assumption is less obvious. In this mode a hypothetical situation is created in which the dubious behaviour is transformed into hypothetical behaviour that the minister would not do. As a result, the counterfactual presentation may blur the fact that the minister’s argument is also completely based on ethos. Many arguments in which an appeal to behaviour is made are presented in the counterfactual presentation mode. My question was to ask why this mode was used for these arguments. In order to answer this question, I have provided a description of these kinds of arguments and addressed the question as to how they should be evaluated. An evaluation of such arguments cannot consist in judging the plausibility of a generalization about human behaviour alone, but has to take into account the character of the person whose behaviour is appealed to or his/her capacity to make a sound judgment about the topic under discussion. These evaluation criteria may have provided one of the reasons that explain the choice of the counterfactual presentation mode. Arguments that appeal to the arguer’s own behaviour may derail in such a way that they completely rely on the arguer’s ethos. It is my impression that this derailment comes less to the fore in the counterfactual presentation mode. [i] How this implicature can be derived from a counterfactual statement is analysed by Ducrot (1973, p. 255-256). His analysis starts with the presupposition of the falsity of the antecedent. He combines this with the idea that what is stated in the antecedent is a necessary condition for what is stated the consequent (on the basis of the Gricean Economy Maxim). This combination results in the implicature of the denial of what is stated in the consequent. [ii] As we will see from the examples, the appeal to human behaviour can only provide evidence for the likelihood or unlikelihood of the state of affairs described in the standpoint. Nevertheless, most arguers who put forward such an argument formulate their standpoints in a much stronger way than their argumentation can account for. [iii] That both reconstructions still contain the same elements is because they are based on structures that are each other’s logical counterpart. The structure of the argument without the counterfactual If…then-sentence is comparable to the structure of a modus ponens argument. 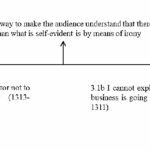 The structure of the presentation mode with the counterfactual If…then-sentence is comparable to the structure of a modus tollens argument (for more see Jansen 2007a). Aristotle (1975). The Art of Rhetoric. With an English translation by John Henry Freese. The Loeb Classical Library 193. Cambridge (Mass. ): Harvard University Press. Braet, A. (2004). The oldest typology of argumentation schemes. Argumentation 18, 127-148. Braet, A. (2007). De redelijkheid van de klassieke retorica. De bijdrage van klassieke retorici aan de argumentatietheorie. [The Reasonableness of Classical Rhetoric and the Classical Rhetoricians’ Contribution to Argumentation Theory.] Leiden: Leiden University Press. Eemeren, F.H. van (2010). Strategic Maneuvering in Argumentative Discourse. Amsterdam/Philadelphia: John Benjamins Company. Eemeren, F.H. van, & R. Grootendorst (1992). Argumentation, Communication and Fallacies. A Pragma-Dialectical Perspective. Hillsdale etc. : Lawrence Erlbaum. Eemeren, F.H. van, & P. Houtlosser (2002). Strategic maneuvering in argumentative discourse: A delicate balance. In F.H. van Eemeren & P. Houtlosser (Eds. ), Dialectic and Rhetoric: the Warp and Woof of Argumentation Analysis (pp. 131-159). Dordrecht etc. : Kluwer Academic Publishers. Ducrot, O. (1973). Präsuppositionen und Mitverständnisse. [Presupposition and misunderstanding] In J.S. Petöfi & D. Franck (Eds. ), Präsuppositionen in Philosofie und Linguistik [Presupposition in Philosophy and Linguistics] (pp. 241-260). Frankfurt/M: Athenäum. Jansen, H. (2007a). Refuting a standpoint by appealing to its outcomes: Reductio ad absurdum vs. argument from consequences. Informal Logic 27(3), 249-266. Jansen, H. (2007b). Strategic use of reductio ad absurdum. In F.H. van Eemeren, J.A. Blair, Ch.A. Willard & B. Garssen (Eds. ): Proceedings of the Sixth Conference of the International Society for the Study of Argumentation (pp. 701-704). Amsterdam: Sic Sat. Jansen, H. (2007c). Common ground, argument form and analogical reductio ad absurdum. In H.V. Hansen, Ch.W. Tindale, J.A. Blair, R.H. Johnson & D.M. Godden (Eds. ), Dissensus and the Search for Common Ground. [CD-Rom] Windsor, ON: OSSA 2007. Jansen, H. (2008). Argument form and rhetorical effectiveness: The presentation of refutational analogy. In F.H. van Eemeren, D. Cratis Williams & I.Z. Zagar (Eds. ), Understanding Argumentation. Work in Progress (pp. 47-54). Amsterdam: Sic Sat – Rozenberg. Jansen, H. (2009a). Legal arguments about plausible facts and their strategic presentation. In J. Ritola (Ed. ), Argument Cultures. Proceedings of the 8th OSSA Conference, University of Windsor, 2009. [CD-rom] Windsor, ON: University of Windsor. Jansen, H. (2009b). Arguing about plausible facts. Why a reductio ad absurdum resentation may be more convincing. In E.T. Feteris, H. Kloosterhuis & H.J. Plug, Argumentation and the Application of Legal rules (pp. 145-164). Amsterdam: Sic Sat. Jansen, H. & M. Dingemanse & I. Persoon (2009). Limits and effects of reductio ad absurdum argumentation. In T. van Haaften, H. Jansen, J.C. de Jong & A.W.M. Koetsenruijter (Eds. ), Rhetoric in Society. Papers Second Conference. [CD-rom] Leiden: Rhetoric in Society. Rhetorica ad Alexandrum (1937). With an English transl. by H. Rackham. The Loeb Classical Library 317. Cambridge (Mass. ): Harvard University Press. Walton, D.N. (2002). Legal Argumentation and Evidence. University Park: Pennsylvania State University Press. ISSA Proceedings 1998 – Evaluating ‘Pros’ And ‘Cons’: More Or Less Polarised Opinions?